I’m pleased to report from the front lines of 2012 flavor forecasting. McCormick Spices invited me to a webinar to learn all about the new flavor profiles they’re anticipating for 2012. McCormick Test Kitchen Chef Mark Garcia developed modern flavor combinations – six different trends – with enticing names like Honoring Roots (the Korean flavors look awesome) and Flavorful Swaps (where a grapefruit/cayenne combo stands in for lemon pepper – cool, right?) It’s the first time McCormick has gone global, and it’s really exciting. The McCormick folks also asked a few bloggers to think about these flavor profiles and how they might influence our menus. Please check out and LIKE the McCormick Spices Facebook site for new ideas and so many great recipes. The blueberry-cardamom-corn combination (No Boundaries – joining exotic cardamom from India with New World corn) was introduced at the webinar and inspired this sponsored post. The freezer has haunted my dreams lately. I fear what is hiding in there. I’m unsure of nearly one third of what is in the bottom of the chest freezer and the one below the refrigerator isn’t much better. It’s a great time of year to practice flavor ideas of your own by making little tiny batches of fruit preserves, syrups, jams and jellies. (I am also capable of seeing this last statement as some sad mixture of denial and compulsion.) All winter, as I open jars and taste, I make notes about the brilliant combinations from last year and those I won’t bother with again. With the happy freezer discoveries of a few bags of fruit and the inspiration of McCormick Spices new 2012 Flavor Profiles, I began to experiment. It was easy to decide what to do with tiny strawberries and an equal amount of rhubarb. Combine them with a bit of sugar (not much,) orange juice and rind and a vanilla bean and I had a compote to stir into yogurt and granola. That’s this week’s breakfast. And a small ziplock bag of peeled peach slices was just a mouthful of summer. I ate them right away, partially defrosted, the best fruit pop ever. Sour cherries got candied, using David Lebovitz’ recipe from The Perfect Scoop, all ready to be stirred into ice cream. The best ice cream ever. If you don’t have this book or an ice cream maker, get them, and consider 2012 your year of ice cream. The combination of this book and a machine is dangerous. But worth it. 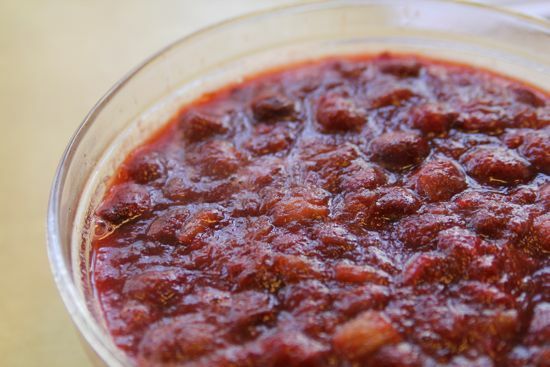 These candied cherries are fantastic and while David recommends a drop of almond extract, I’m sticking with vanilla. McCormick’s Simplicity Shines profile – vanilla and butter – made perfect sense to me and brown butter vanilla ice cream with candied cherries and a chocolate ripple was divine. So divine in fact, there are no photos. When I unearthed a massive bag of frozen blueberries, the McCormick No Boundaries flavor forecast started an idea brewing. You see, Dennis adores blueberries and I’ve made all sorts of blueberry jams and preserves, but he just doesn’t eat them. Syrup, on the other hand, he will eat. We have pancakes or waffles for breakfast frequently, and a blueberry syrup flavored with cardamom seemed like a wonderful idea. 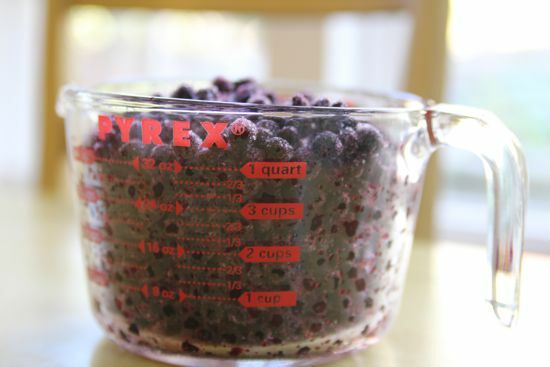 I used the Ball Blue Book of Preserving recipe for Blueberry Syrup and riffed from there. It was a simple technique, resulting in an incredibly fresh tasting syrup, the cardamom was floral and subtle and scented. It’s not a thick syrup, so it’s just right for adding to a glass of seltzer for a blueberry spritzer. And it’s heavenly poured over avocado slices, grapefruit sections, toasted almonds and butter lettuce for a snappy lunch. 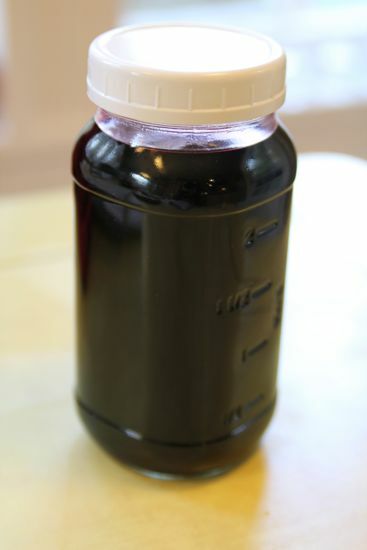 Oh, yes, I will be making a lot of this syrup when blueberry season comes around. Tonight, dinner was breakfast. Or breakfast was dinner. 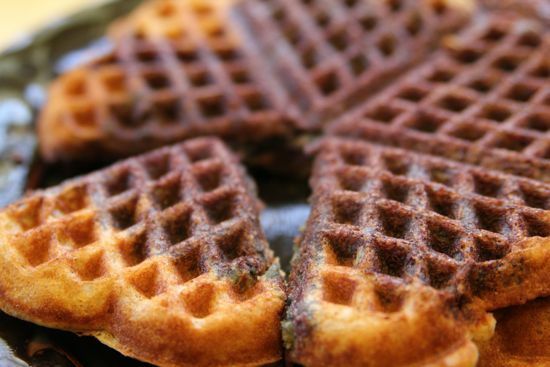 I made a blueberry maple syrup, combining the blueberry syrup with Grade B maple in equal portions, then warmed it up to pour over perfect sweet corn (from the freezer) studded cornmeal waffles. I slightly modified the classic recipe from Marion Cunningham’s Breakfast Book, a hard to find treasure, but by far the best cookbook for breakfast foods. McCormick Spices, thank you so much. I’m waking up in the middle of the night with food ideas and scribbling them down in a little notebook. I have so many recipes I want to try with the box of goodies that arrived. Watch this space for some new recipes – some savory, some sweet – and all created from the inspirational flavor forecasts from McCormick. Combine the blueberries, one cup of water and the cardamom in a medium saucepan. Crush the berries with a potato masher and bring everything up to a boil. Reduce the heat and simmer for five minutes, then strain through several layers of cheesecloth or a chinois or a jelly bag. You should have about 4 cups of liquid. Set aside. Rinse the saucepan and add the sugar and 2 c water. Bring up to 230° – this will take about 30-40 minutes. Add the blueberry juice to the syrup and cook for five minutes. Add the lemon juice. Blueberry Maple Syrup is half blueberry syrup and half maple syrup. Heat it up for the best flavor. In a medium bowl, combine the dry ingredients and whisk until blended. In a largish measuring cup, add milk, oil, yogurt and egg and beat until combined. Stir the wet ingredients into the dry and mix until blended. 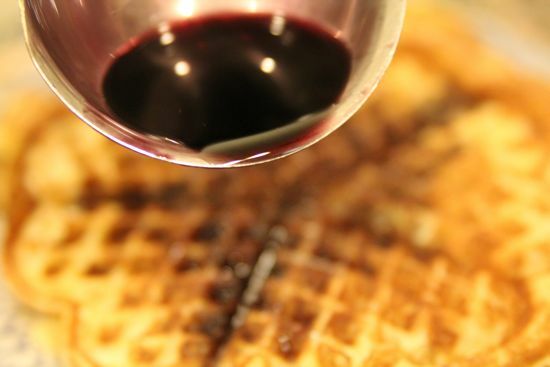 Serve the waffles with heated blueberry maple syrup and a side of crisp bacon. Even in January, this post, combining two of my favorites, screams summer to me. Beautiful! I can’t type because I’m too busy mopping up the drool before it hits the keyboard. 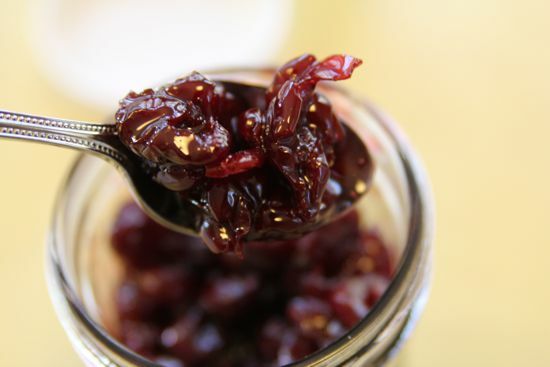 I always make candied cherries with the cherries from my trees. And I have The Perfect Scoop so I’ll be using it to make that candided cherry ice cream! 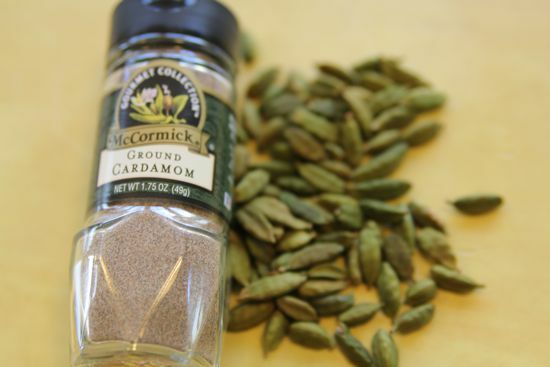 I love your inspiration, especially combining cardamom (one of my favorites) with blueberries (another favorite). I’m thinking that syrup combined with heavy cream would make a really good panna cotta as well. Now you have me thinking! Oh my goodness Cathy – you went all out 🙂 Holy deliciousness! I love love love these flavours and combined they really pack a punch. Nice work! YUM. Saving this in my Summer and Gifting files… thanks for sharing!